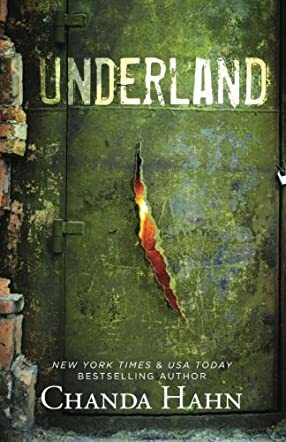 Underland by Chanda Hahn is a young adult paranormal novel with urban fantasy elements. Kira hadn’t always been lost; once she’d had a family, a father who loved her and shared with her the experience of his Navy SEAL training. When she had awoken with night terrors, he had chased them away, but when he died the nightmares became flesh. She fled the streets to escape the wrath of her violent step-father, and for two years she had survived. Then one night the monsters returned, plunging her into a world of slavery where she was sold to the highest bidder. Humans are the lowest of the low, the bottom of the food chain, so what chance does she really have in this mythical world beneath the streets? As if things weren’t bad enough, she is selected to participate in the games. Her new prison is already filled with enemies, creatures thought only to be myth, who would prefer to kill her rather than look at her, especially given the entrance she made into their territory. Can she form the alliances needed to survive in this terrifying world, and how can she, a lowly human, hope to compete in a game in which even those with a lifetime of training struggle to survive? For me, Underland had a very Neverwhere (Neil Gaiman) feel to it. Not in the sense of a mirrored storyline, but in the creation of a vast world below ours, where creatures once feared, and those forgotten, now live. Combine this with the more well-known Hunger Games series, a fight to the death for the pleasure of those watching, add a chance of earning freedom and creatures of legend, and you have the fantastic story woven by Chanda Hahn. The author’s style of writing is suited to the new adult, young adult age group, which is the chosen target audience, and it reminded me in places of the horror genre. The only thing which would have enhanced the reading experience for me would be a little more description in some places. There is this vast land, filled with more creatures and monsters than you can imagine and, whilst scope is implied, a few more details would have expanded the greatness and magnitude of this world, seeing it reach its full potential. I would recommend this book - by a quarter of the way through I didn’t want to put it down and I had become invested in Kira and her struggle, wanting to know what happened next. The gripping tale of an underdog trying to survive alone against all odds is enough to grab any reader’s attention, but throw in mythical creatures and ancient gods and you have a combination bound to inspire.